Mount Pleasant High School senior Audrey Courreges was recently selected the Daughters of the American Revolution (DAR) Good Citizen. She is the daughter of Steve and Cathy Courreges. The Martha Laird Chapter of the National Society of the Daughters of the American Revolution sponsors the DAR Good Citizen program in our area. This contest is designed to honor an outstanding young person in a high school’s senior class who demonstrates the four qualities of a DAR Good Citizen: Dependability, Service, Leadership, and Patriotism. Courreges has held numerous leadership roles in campus organizations. She is currently Secretary of National Honor Society, Captain of the Speech and Debate team, Captain of the Current Events Leadership team, and has served as Manager of the MPHS Goin’ Gold Band. In addition to leadership, service to the community is another important characteristic that good citizens possess. Courreges helped create a peer tutoring program where students can receive free tutoring after school in various subjects. She has managed that program successfully and also raised money to award a scholarship to the most valuable tutor in the program. She has also spent numerous hours volunteering at UIL Events, parking cars at the Titus County Fair, and helping with various other school and community functions. Courreges won the National Speech and Debate Associate (NSDA) All-American Award and received NSDA Outstanding Distinction. She was also a member of the first team in school history to qualify for the TFA state tournament. She won the Most Valuable Extemp-er Award in 2017 and was selected as the Newcomer of the Year in 2016. She received the Academic Blanket Awards in categories for English I, English II, and English III. 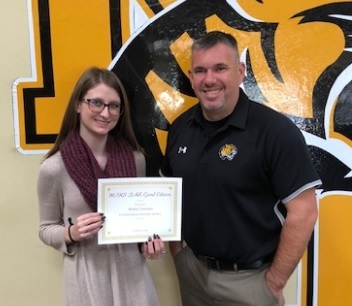 As a junior, she won the John Ratcliffe Rising Lone Star Award, the Woodmen Life American History Award, and the Lions Club Outstanding Youth Award. She also received the Ronald Reagan Student Leader Award during her sophomore year. Being selected as the MPHS Good Citizen provides Courreges the opportunity to participate in the scholarship portion of the program at the local Chapter level. Each contest entry is evaluated by independent, non-DAR judges. The winning entry is advanced through state and national levels of judging.